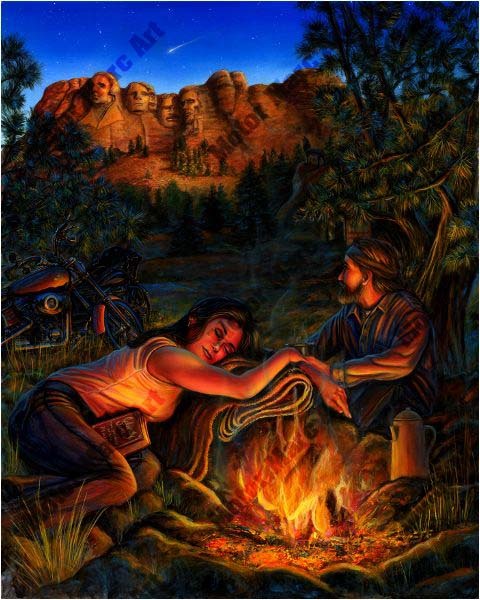 Media Size Choose an option18" x 22"24" x 30"32" x 40"
A day’s ride into Sturgis, brings a nights rest for this couple. As the Shrine of Democracy towers over them, it casts a shadow of twilight over the Black Hills of South Dakota. The couple builds a fire and prepares for the cool night air to fall. Our female rider has just put down a novel she was reading about Calamity Jane, (one of the rowdiest and adventurous women in the Old West), then gently lays her head on a rolled up blanket and falls fast asleep. Overhead the sparkle of a shooting star shines as the great wolf howls, bringing on the night. Her partner takes a moment for a warm drink, and soaks in the majestic view of George Washington, Thomas Jefferson, Theodore Roosevelt and Abraham Lincoln, impressively carved into the face of the cliffs. 18" x 22", 24" x 30", 32" x 40"